My trip to China was a challenge. I had to schedule my trip to follow the new 72-hour Visa-Free Transit process; I didn’t have time to go through the normal visa process. 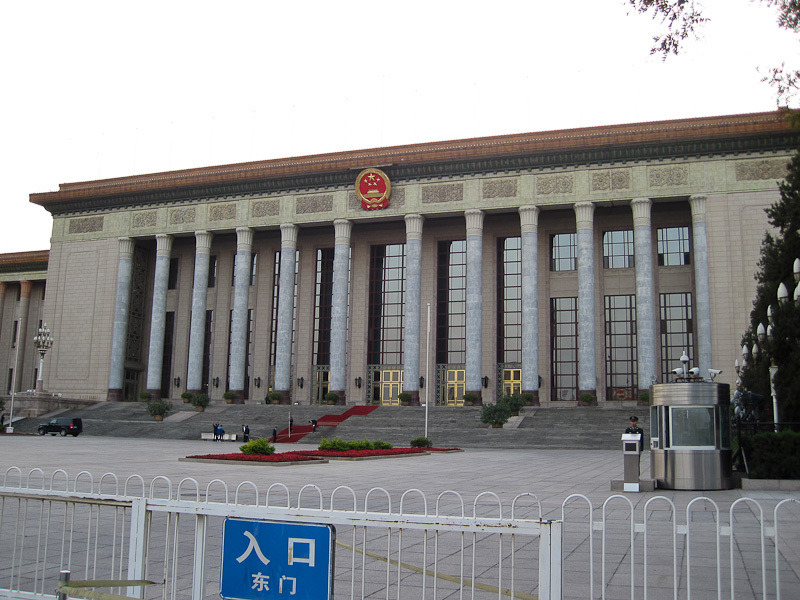 I am pleased to report that my visit to Beijing worked out well, but it was more complicated than I thought it would be. I share my notes here for my records and perhaps the benefit of others. My host gave me 3 weeks to plan my travel, but I was already scheduled for two other overseas trips so I couldn’t put my passport through the normal (or even expedited) visa process. 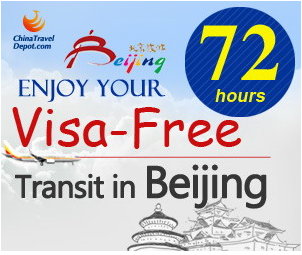 So my host suggested that I travel on the 72-hour Visa-Free Transit visit process. I had never heard of this and was skeptical (if not a little reluctant). The 72-hour Visa-Free Transit rules say that you need a travel itinerary where your departure time is less than 72 hours after the time your inbound flight is scheduled to land. AND, you need to be heading to a different country from which you came. I booked a flight from Chicago to Beijing that landed Monday afternoon. Then I booked a return flight to Tokyo to leave Thursday morning. My Tokyo flight had a 3 hour layover for me to connect with a flight back to Chicago. 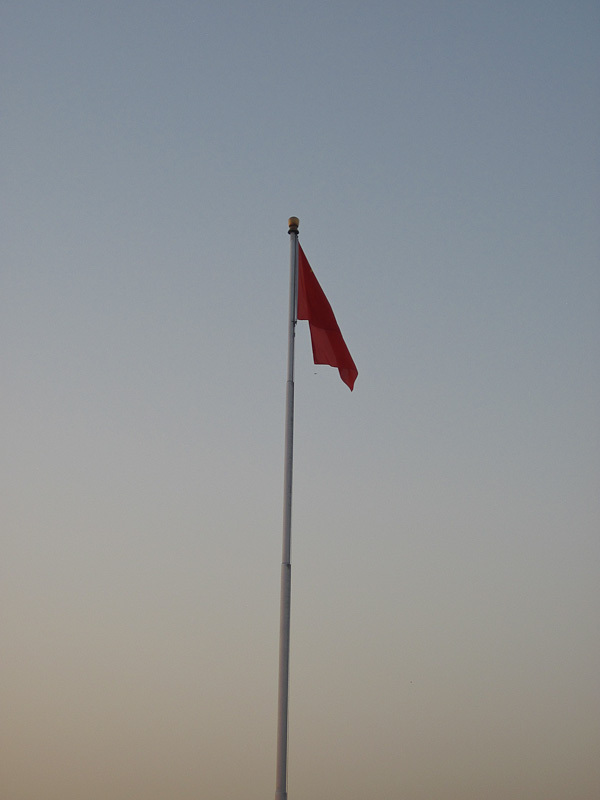 BTW, there’s lots more rules: you cannot leave Beijing, you have to be from one of the approved countries, and more. Please don’t go by what I say here, go research this yourself. This worked. But I had to go through several document checks, with each step adding some doubt and uncertainty. When I started the trip, my airline required me to show my China visa at the ticket counter before they would give me a boarding pass. Not surprisingly, everyone in line ahead of me had a visa. When I got to the head of the line, the poor agent had no idea what I was trying to do. 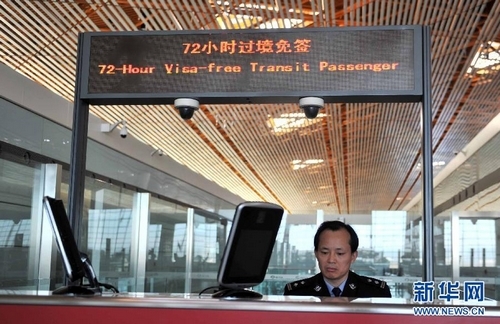 He said “… you have to have a visa to get a boarding pass.” So I pulled out a print-out of an FAQ from the Chinese Embassy that explained the 72-hour Visa-Free Transit policy; I pulled out a TripAdvisor.com posting, and I pulled out a print-out of a travel blogger’s experiences (including photos). I showed all of this to the agent and only a brief 5 minutes later he gave me a boarding pass. I thought that once I got a boarding pass, I was set. But no. At the boarding gate there’s a roped-off line with a sign saying secondary document checks. I was the first in line. I gave them my visa-less passport, my itinerary, and print-outs from several web pages. The first agent I saw, she didn’t know what to do; she took all my papers then said she was calling her supervisor. Well he came, and didn’t know what to do; they both consulted with someone else. They asked me to sit down; they’d get back to me. Well finally a ticket agenda who knew how to read Chinese came to the gate and she knew what to do right away. They stamped my boarding pass and let me on. This was more drama than I wanted, but understandable. After my long 13 hour flight, with some anxiety I got off my plane at Terminal 3 at the Beijing airport. After a short walk I get to the immigration area. Much to my delight there were two lines dedicated to 72-hour Visa-Free Transit visitors. I went to one of the lines and it was closed?! I politely asked and an immigration agent pointed and said “Foreigner.” This meant I should get into one of the 6 or so lines with a big title of foreigner over the agent’s station. I got into one of the lines. It was long but it moved fast. Clearly everyone in front of me had a visa. Gulp, was my immigration agent going to know what to do? I gave him my passport, my itinerary, and I said “72-hour Visa-Free Transit .” He apparently knew what I was talking about. He called over one of his associates and they directed me to a separate desk where my travel itinerary was checked. The agent took out a special, big-ish stamp, stamped my passport, and let me pass. Overall, very smooth. Yeah!! Once I got passed immigration, there was a big back-lit poster celebrating the 72 hour transit visa — implying a welcome for all of us visitors entering under the new process. Thanks, I am glad to be here, so it was OK. I landed in Beijing on a Monday afternoon; I left on a Thursday AM flight. Exiting China at the Beijing airport was very smooth. My passport and boarding pass were briefly checked, stamped and then I went through security, very much, like normal. I was surprised by the reaction of my host. I got some adventure-traveler bonus points from the him and other members of the local team because I was willing to try the new process, but in retrospect it wasn’t that hard and hopefully my story can help others. In summary, make sure you have a printed copy of your travel itinerary, and make sure your departure is to a different country from where you came, and make sure your departure time is less than 72-hours from your landing time, and read the FAQs for all the details of the rules. 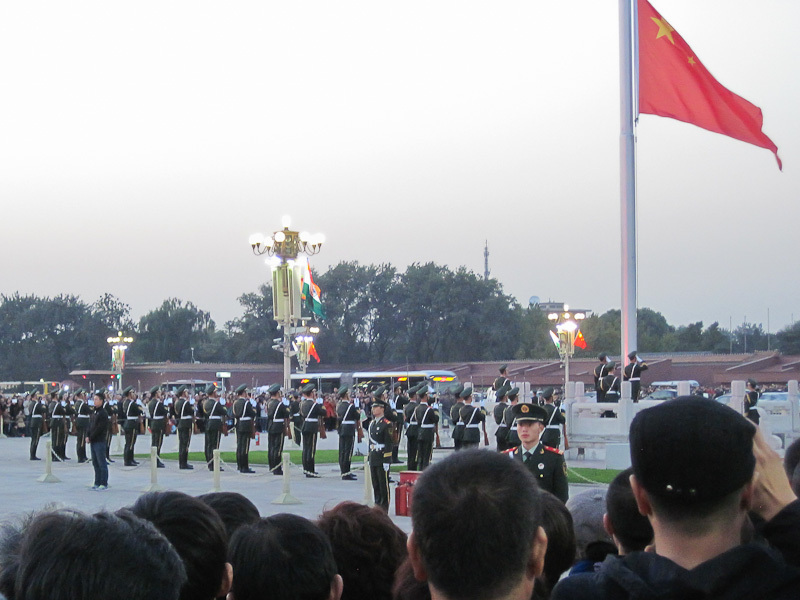 Background on my evening Tiananmen Square Walk: My short visit to Beijing was almost over, my meetings were completed, and I had a short 60 minutes to do some sight seeing. 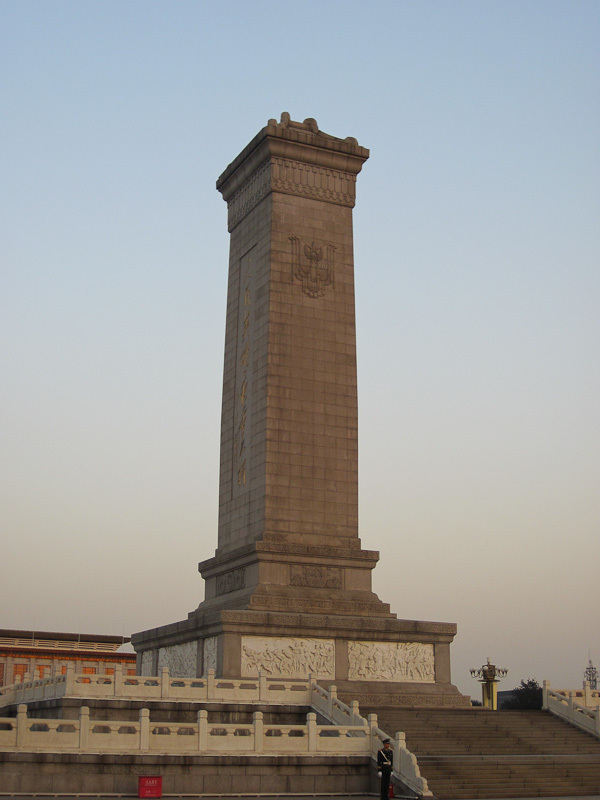 My host had to leave for Shanghai, and I was left with our nice to driver, who agreed to drop me off at Tiananmen Square for one hour. I was looking forward to this! The traffic along Chang’an Avenue was really heavy and he couldn’t park close, so he found a section of the street two blocks away where he waited for me. With a finger pointing to the square, he set me off on a solo walk. I started east walking by the architecturally unique National Centre for the Performing Arts (really beautiful! 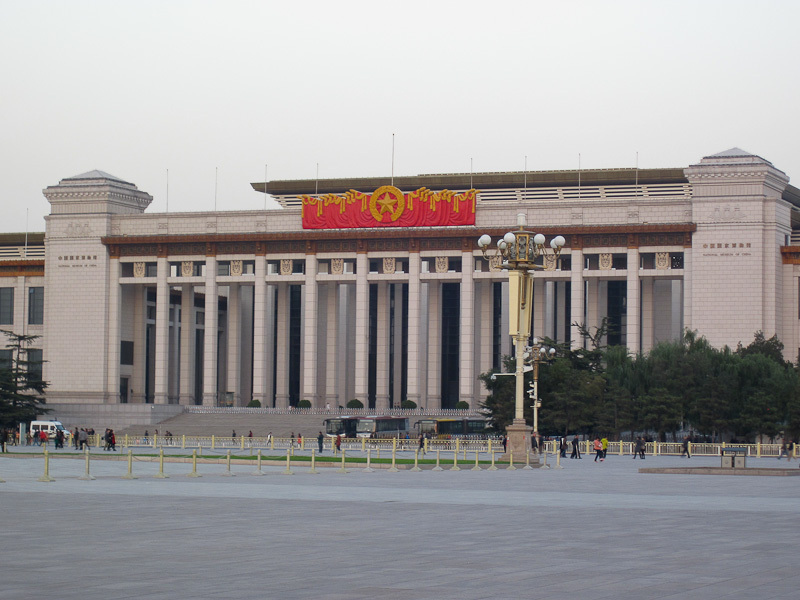 ), I then followed along Chang’an Ave passed the Great Hall of the People and reached the north west corner of the square. 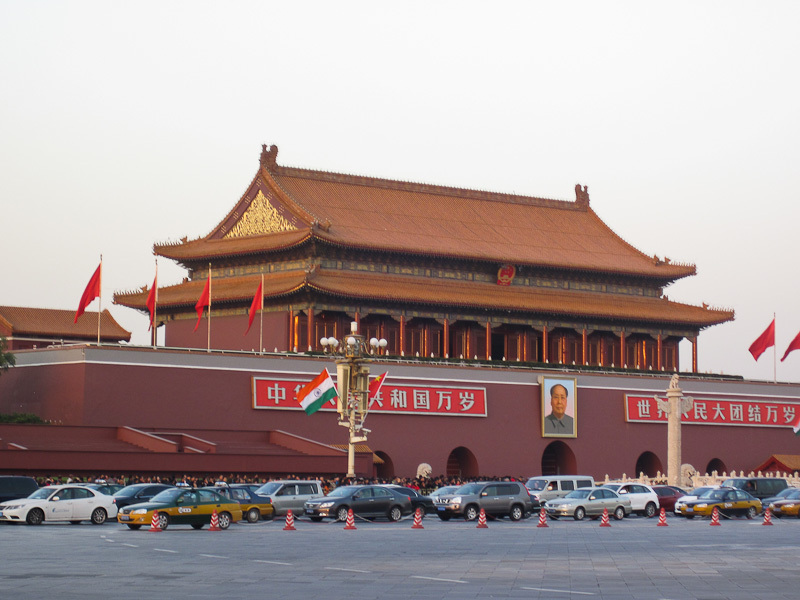 I saw the Tiananmen Gate, the iconic entry way to the Forbidden City, with the picture of Chairman Mao on it… this is one of the most common images you see in tourists pictures. 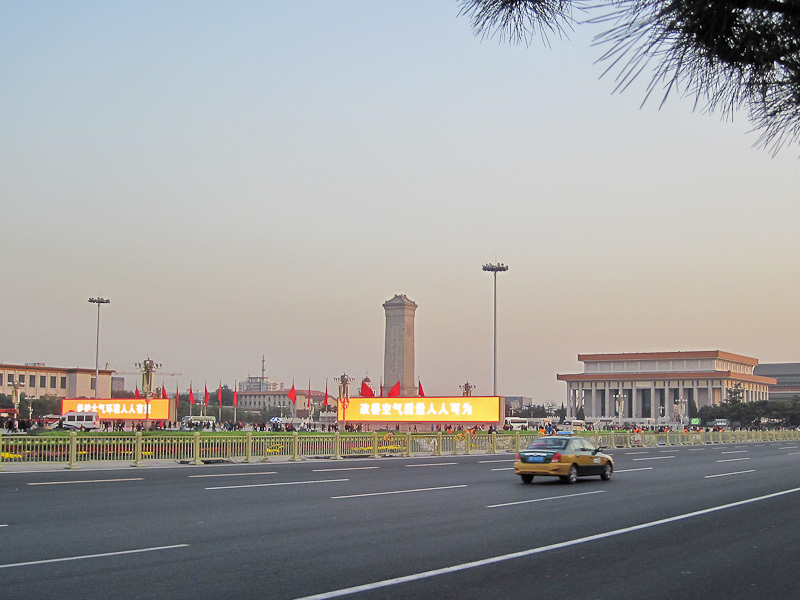 Tiananmen Square is physically across Chang’an Ave, south from the Gate. The plaza area is fenced on all sides, and if you look at the pin on Google Maps, it’s right at the entry I went through. The entry is a guard station that scans all packages and backpacks. I was waived-through no problem. Overseas tourist types like me, while not common, looked welcome. I would say most of the visitors to the square were citizens of China from other parts of the country (lots of tour buses). 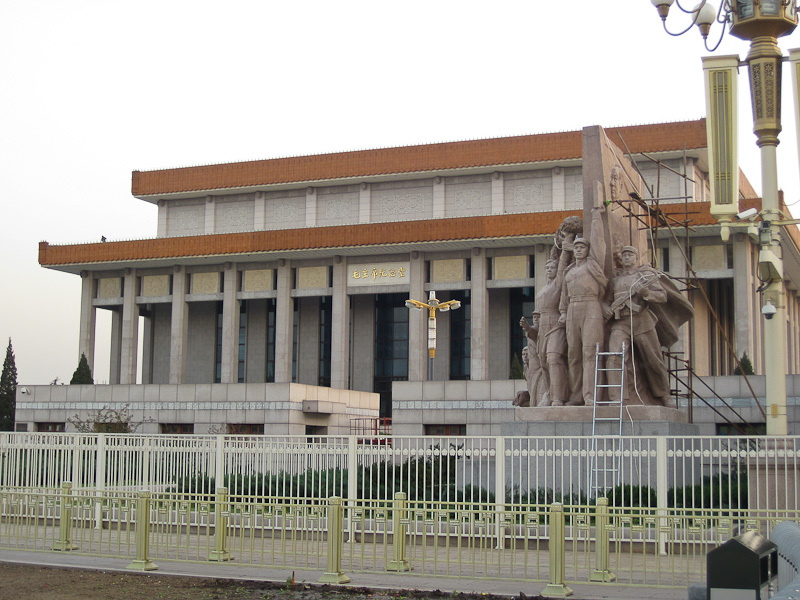 While at the square I briefly walked by The National Museum of China, Mausoleum of Mao Zedong, Monument to the People’s Heroes, and very popular flag pole. 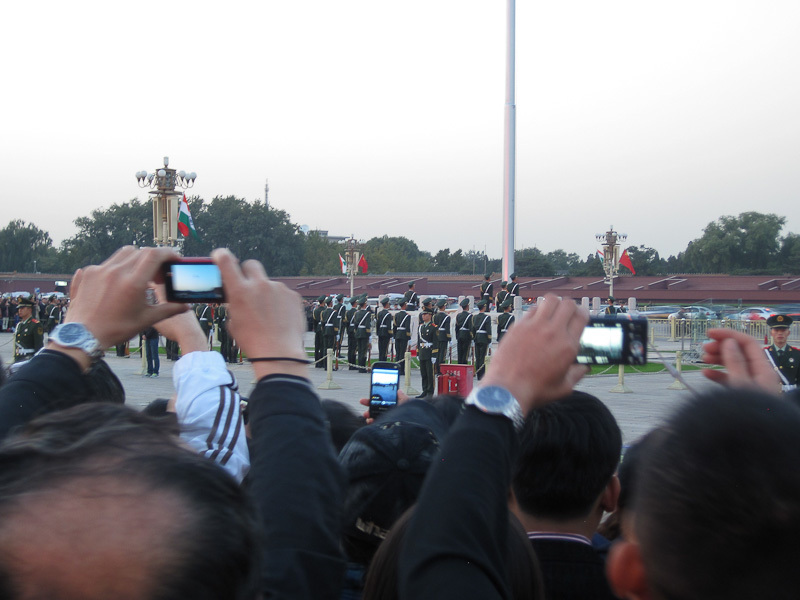 I got there right at sunset and 100s of people were gathered around the flag pole as the soldiers, in a very solemn ceremony, lowered the flag, right at sunset. 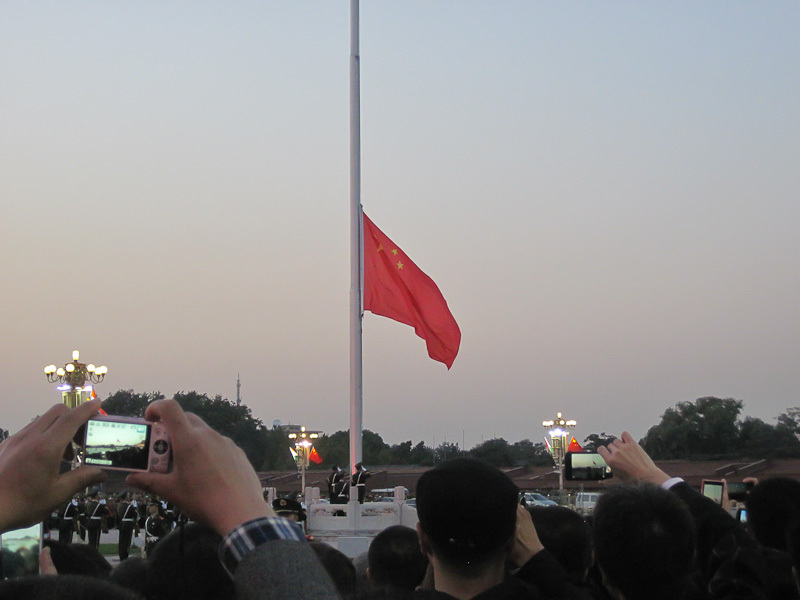 When the flag was lowered, the Tiananmen Gate lights were turned on. It looked really nice! A couple of people from a university came up to me, in excellent English welcomed me to China, asked me where I was from and with pride shared some of China’s history with me. Very memorable. But it was time to go. I didn’t want to keep my driver waiting. 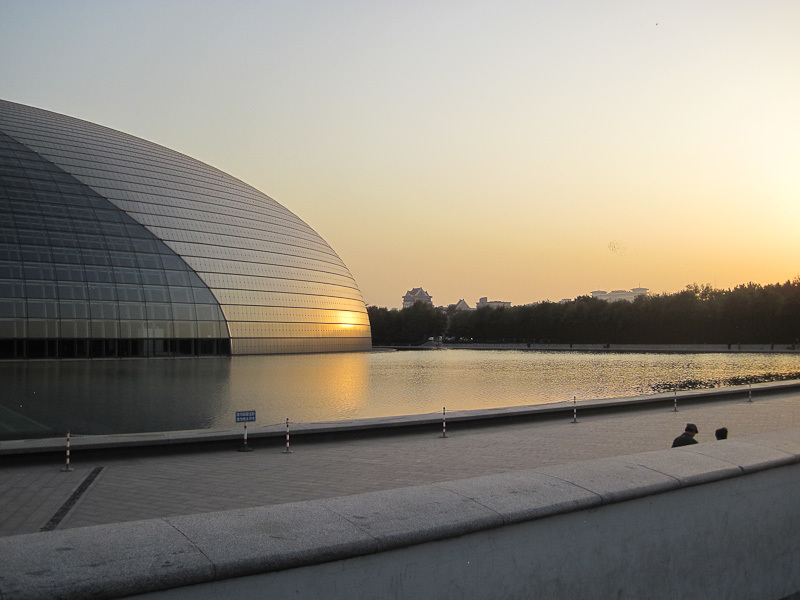 I haven’t been to China in over 8 years and it was very nice to be back. 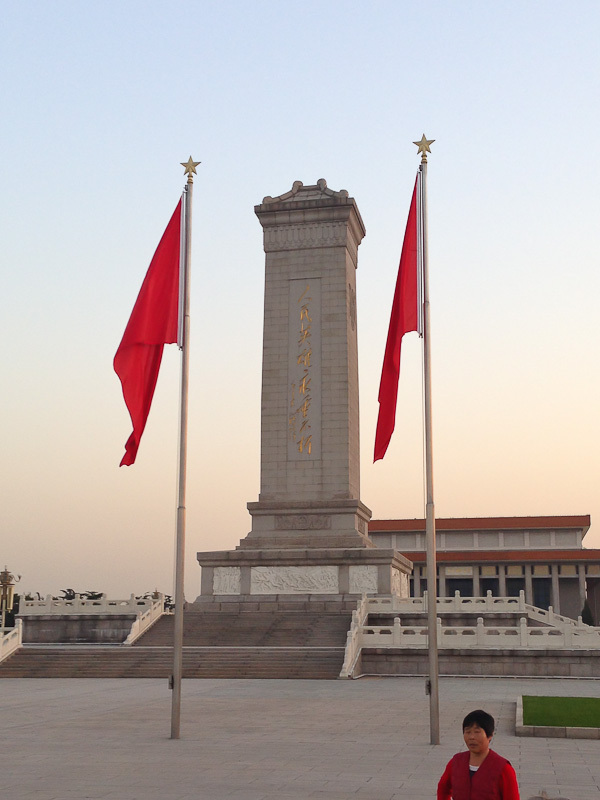 I had a really nice Tiananmen Square Walk. As business travelers who go to the Dongcheng or Xicheng Districts in the city center know, during rush hour, the Chang’an Ave is 10 lanes of very, very slow traffic. 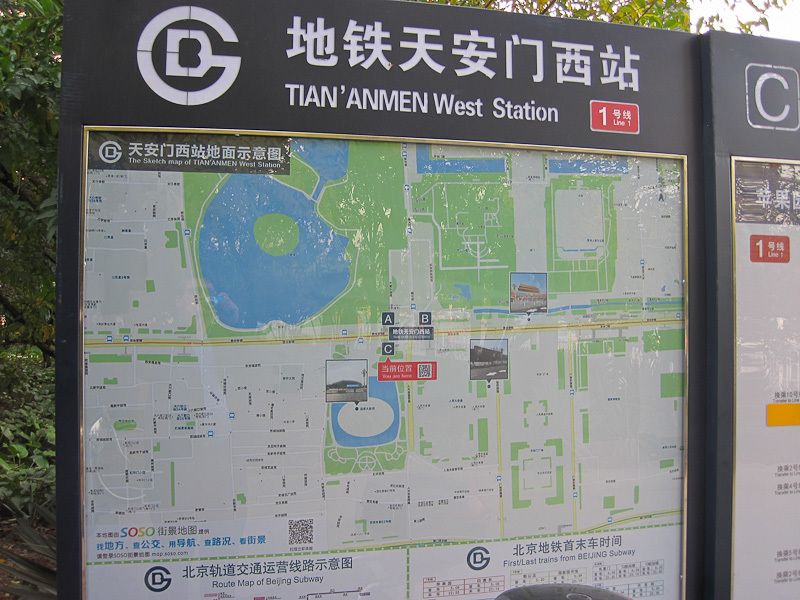 After my brief walk through Tiananmen square my driver had to drive 3 miles to my hotel. It took over 40 minutes. 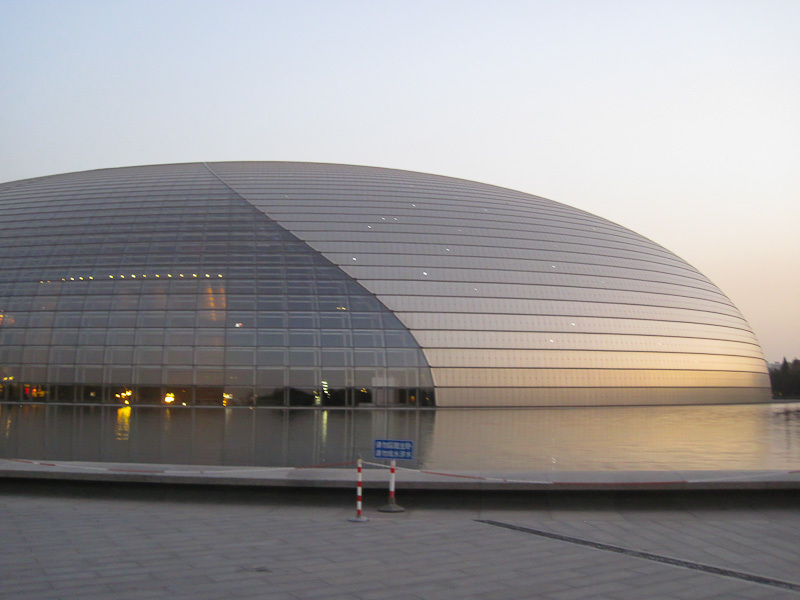 This is Beijing — get used to it. The last time I was in town, my host had me use the subway — probably a good idea for next time. There’s so much more to see in this area. 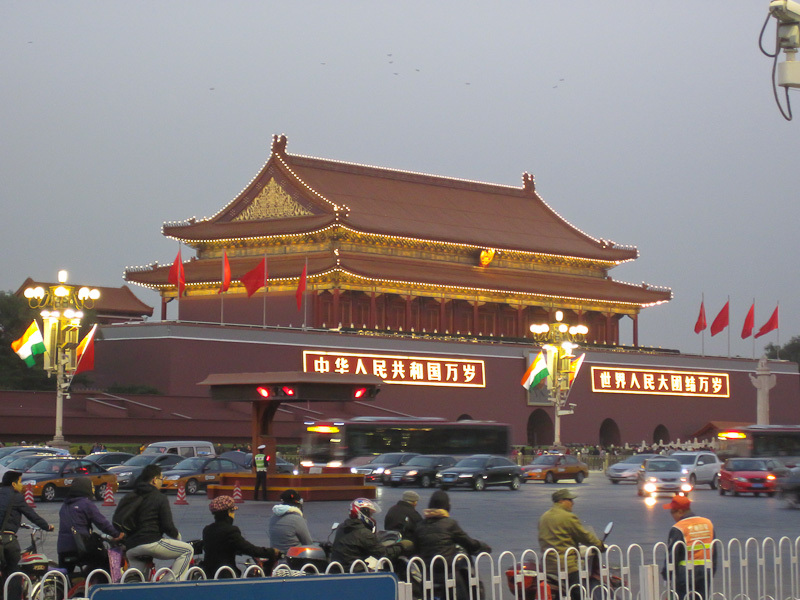 I didn’t have time to go into the Forbidden City. There’s some really nice outdoor shopping bizaars nearby, and the museums are beautiful, but not this trip. Maybe some other time.